In this post I am going to explain about FEED subscribe buttons, some sites like Google, Yahoo, MSN, AOL and more those sites we directly subscribe favorite site FEED URL. Some we can view all updates from those sites. In this below example URLs please replace the text [URL] to your site RSS (FEED) URL. This page it will show option to add in IGoogle or Google reader. This is will list all feeds with subscribe button. Tried to access this http://add.my.yahoo.com/rss?url=http://shareourideas.com/feed/ – it seems to be broken? 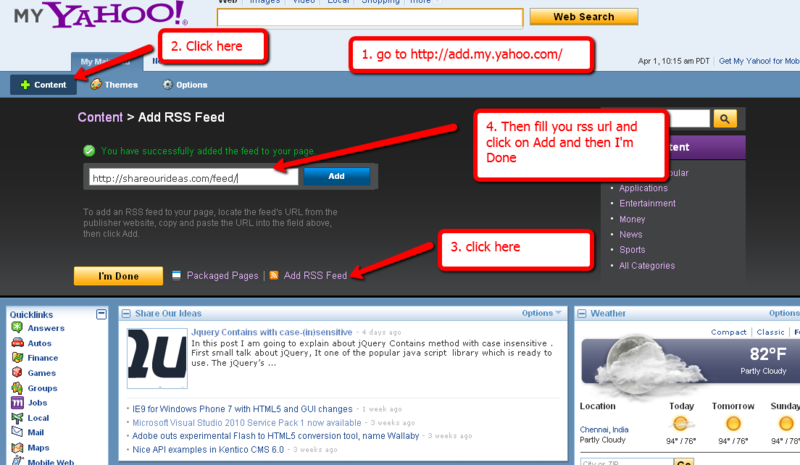 do you know the new way in subcribing feed in yahoo? if I found any other way like just passing in URL, I will let you know that. more you share, more you gain!